Fed Keeps Rates Steady But Expresses Caution About The Global Economy : The Two-Way Federal Reserve policymakers said they believe the U.S. economy is growing at a moderate pace, and that any increases this year will be "gradual." Traders on the New York Stock Exchange greet the news that the Federal Reserve has decided against another interest rate hike. 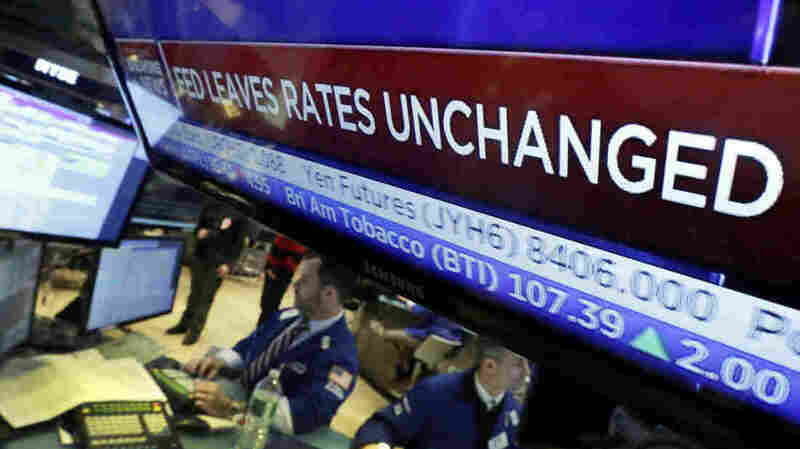 The Federal Reserve has decided to keep its benchmark interest rate where it is, even as Fed officials expressed somewhat more caution about global economic conditions. In a statement issued after the end of policymakers' two-day meeting, the Federal Open Market Committee said the federal funds rate would stay at 25-50 basis points, where it was set at the Fed's December meeting. Fed officials did not explicitly rule out a rate hike at their next meeting, in March, but said any hikes this year will be "gradual." They also made clear that despite the dismal slide in the stock market in recent weeks, they still believe the U.S. economy is growing at a moderate pace. Household spending and business investment are increasing moderately, and the labor market continues to improve, according to the Fed statement. But the statement also seemed to convey a new note of caution, saying the Fed "is closely monitoring global economic and financial developments and is assessing their implications for the labor market and inflation." Inflation remains well below the Fed's target rate of 2 percent, something Fed board members expressed concern about recently. In addition, net exports have softened and inventory investment has slowed, the statement said. 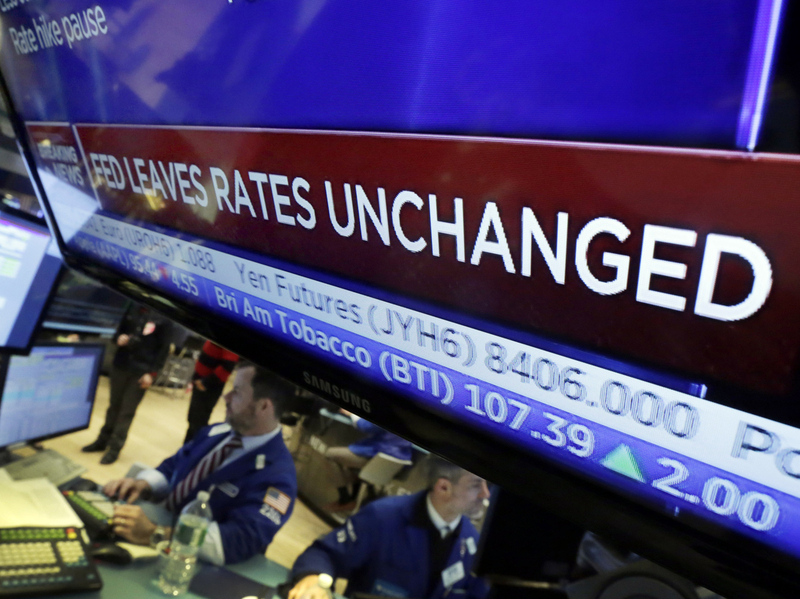 Chris Gaffney, president of world markets at EverBank, noted that the statement no longer says the risks to the economy are "balanced," a sign it is taking the world economic turmoil more seriously. "All in all a dovish statement pretty much taking March off of the rate hike calendar," Gaffney said in a statement e-mailed to NPR. "The primary takeaway from the FOMC's statement is that uncertainty about the outlook has increased, with risks moving to the downside since the previous meeting," said Stuart Hoffman, PNC chief economist.